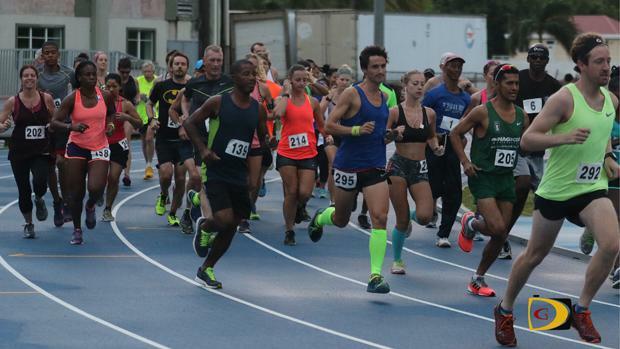 Virgin Gorda resident Vincent Fournier ended Reuben Stoby's year long winning streak in local road races during Saturday's season opening Blenheim Trust 5K Series tour stop in Road Town, breaking the eight year-old course record in the process. Fournier controlled the pace from the start to win the circumnavigation of Road Town from the A. O. Shirley Recreation Grounds and return in 17 minutes, 00.91 seconds. His time eclipsed Steven Asson's 17:09.17 from 2008. Stoby finished in a personal best of 17:07 with Tarique "Tweety" Moses third in 18:14, in the race that saw five runners under 19 minutes. "Every time I race, I try to do my best, I set my own things, if somebody beats me, he beats me, if he doesn't he doesn't, that's just how it goes," Fournier pointed out. "Today, I wanted to do 3:30 per kilometer. I ended up doing it and I'm proud of myself. I ended up winning too, so that was a great thing." Stoby said Fournier pushed a good pace and he was feeling comfortable for the second mile and was right there with him. "At the end, I just couldn't keep up, he was very consistent so it was a very good run," Stoby explained. "About the fourth kilometer, he put on a stretch that I couldn't cover." Fournier said he heard Stoby's breathing throughout the race. "I never really knew if he was going to give a surge or not, so in the end, I was happy to see him enter (the A. O. Shirley Grounds) way behind and I was like 'yes, I got this.'" Stoby is now looking forward to an interesting battle in defending his Male Road Racing Athlete of the Year title. "This certainly makes the season very interesting with Fournier in the mix now, so I'm looking forward," Stoby stated. "The aim this year is to run 16 (minutes) in the 5K and I've managed 17:07, smashing my personal best, so a very interesting season ahead." Katrina Crumpler who missed last year's series because of injuries, returned and wiped out Claire-Louise Whiley's women's mark of 22.45 from 2011, with a time of 20:11.83. "It was really fast and I think the conditions were really good, nice and cool, a little bit of wind," she noted. "The first mile was too fast for me. I was trying to keep up with the boys and did about 6:20 which was really quick, so I backed off a bit over the second mile because of the hill and picked it up again." Final Results: Men1. Vincent Fournier, 17 minutes 00.91 seconds, (New course record. Old record, Stephen Asson 17:09.17, March 14, 2008.) 2. Reuben Stoby, 17:07. 3. Tarique Moses, 18:14. 4. Julius Farley, 18:32. 5. Guy Williamson, 18:52. 6. Michael Killourhy, 19:28. 7. Emrol Amsterdam, 19:57. 8. Stephen Asson, 20:05. 9. Zebalon McLean, 20:11. 10. Simon Cook, 20:49. 11. Simon Cross, 21:14. 12. Guyp Dubois, 21:27. 13. Adrian Dale, 21:41. 14. Ishwar Persad, 21:49. 15. Daniel Mitchell, 22:02. 16. Charles Kerins, 22:23. 17. Martin Trott, 23:02. 18. Lovat Carnally, 23:19. 19. Ravindra Sukhu, 23:20. 20. Dennis Delacruz, 28:40. 21. Howard Moore, 28:54. 22. Ravenal Santos, 31:44. 23. William Kinkead, 33:28. 24. Barry Leon, 34:16. Women: 1. Katrina Crumpler, 20:11.83 (New course record. Old record, Claire-Louise Whiley. 22 minutes and 45.41 seconds, 2011.). 2. Rosmond Johnson, 21:21. 3. Melissa Brunner, 22:19. 4. Amy Sweeney, 22:23. 5. Lauren Julien, 23:06. 6. NiMade Oniasih, 23:51. 7. Anna Kinkead, 24:25. 8. Chloe Harris, 24:35. 9. Melisande Rowe, 24:45. 10. Philomena Robertson, 25:23. 11. Brodie Faragher, 26:27. 12. Sophia Addas, 26:27. 13. Clair Burke, 31:06. 14. Sara Knock, 32:16. 15. Simpa Ganadillo, 32:42. 16. Claire Santillan, 32:29. 17. Nedy Adordionicio, 33:40. 18. Jenny McConnell, 36:17. Power Walkers: 1. Shirley Liburd, 45:45. 2.= Sophie Bennett and Linda Li, 48:06.